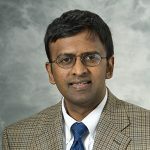 Dr. Vivek Prabhakaran, Associate Professor of Neuroradiology, and his interdisciplinary team of researchers were recently awarded a prestigious five-year NIH-NINDS R01 grant. This grant is worth ~$2.25 million, and is focused on Brain Computer Interface (BCI) technology research and its effects on the rehabilitation time of stroke patients. This team includes Professor Justin Williams, the Chair of Biomedical Engineering, Professor Dorothy Edwards of Kinesiology, Associate Professor Justin Sattin of Neurology, Assistant Professor Kristen Caldera of Rehabilitation Medicine, and Dr. Veena Nair, Associate Research Scientist in Radiology. Strokes are the fourth leading cause of death in the United States, with ~800,000 people suffering each year from a new or recurrent stroke, and around four million Americans currently living with the after effects of a stroke. Dr. Prabhakaran and his team plan to collect neuroimaging (fMRI, DTI) and behavioral measures of around 190 stroke patients to assess the efficiency of novel BCI technology used to rehabilitate these stroke patients, in order to discover more effective stroke treatments. Brain-Computer Interface is a technology that enables direct communication between the brain and an external device. This is more accurate than the current standard of care Functional Electrical Stimulation (FES) because it interacts more with the brain rather than simply strengthening the stroke-affected muscles as it is done with regular FES. Dr. Prabhakaran views this combination of BCI coupled with FES as a “Smart FES” vs. the current stand-alone FES system, which is the current standard of care.